If you’re new to Risk, you may need to learn advanced Risk tactics and find good strategies on how to play so to be able to win every game. Together with Monopoly, Risk is the most popular board game that is played all over the world. It doesn’t matter whether you live in North America or Europe, Asia or Africa, or anywhere else in the world. The rules and goals all over are the same everywhere. The main idea behind Risk is to win over the opposing armies and complete what your mission goal is. Risk has various approaches to what is the easiest way to faster victory, but it all depends first of all on luck, and adequate advanced Risk tactics the player has. Playing more games gives you experience and general idea to how the game flows. Beginners might find Risk difficult at first but after few games you can start to understand which decisions are good and which can lead to winning the game, and to what you must avoid doing if you don’t want to lose. So, if you have few friends interested in playing Risk as a board game, then you can give it a chance and see who will conquer the world. If you are a newbie, read the rest of the article for some general game knowledge and few advanced Risk tactics and tricks which will help you understand the game and have a head start. The first thing you need to understand is the game map. How many territories every continent has, which territory is part of which continent and finally, from where can you attack certain territory. 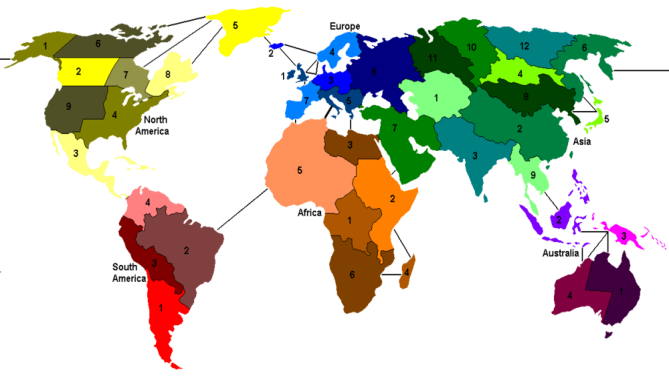 Every continent is divided to a certain number of parts. Asia has the most while Australia has fewest territories. This is important because you get additional reinforcement if you control a whole continent. Adding to this, there are islands and some other additional parts to some of the continents, so you need to have them also to have the whole continent. The Risk map itself is simple to understand. Every continent is marked with a different color so you can’t get confused. While you can attack all the territories next to each other you can attack overseas. The trick here is you need to have arrows showing you which country can attack from a distance. So keep in mind this because you might get surprise attacks from somewhere you don’t expect and that’s why you need to know some advanced Risk tactics. The game Risk starts by equally dividing the cards with territories to all the players. The set contains 42 cards so sometimes you might end up with players having one territory more than the others. If this is the case he will be the last one to attack so not one starts with an advantage. After the cards are dealt each player places his/her army on the territories and waits for the third step of the game. A mission card is drawn by every player. You must not show your mission card to anyone because they might decide to go against you and only lower your chances of winning. So, make sure you are the only one who knows your mission. Finally everyone puts the remaining army on the board and the game can start. The Risk games online are much faster than the original board game, but still playing with friends at home is much more fun and winning the game feels more satisfying. Once everyone is done with putting the army on the board, the first player can start attacking. 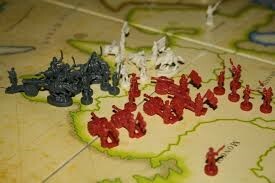 Once all the armies set the soldiers on the battlefield the game can begin. 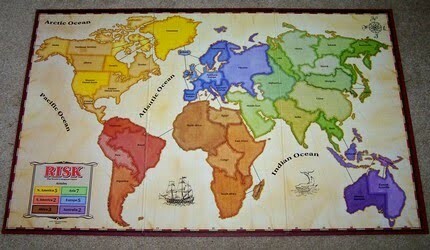 Taking turns, one by one, every player declares and attacks one territory. The attack process has two phases. First the player declares the attack and tells from where to where he attacks. Then he rolls one to three dice, depending on how many soldiers he/she has on the attacking territory. One soldier must remain on the territory when the players are attacking since you can’t lose territory when you attack. On the other hand, the army which is defending also throws one to three dices and the numbers are compared. Whoever has the bigger numbers wins the war. For example, if the attacker has 6, 5 and 1 and the defender has 5, 5 and 2 the defender loses one soldier and the attacker loses 2 soldiers. If both the attacker and the defender throw the same number the defender wins. So, if both players have 5, 5 and 3 the defender wins and the attacker loses three soldiers. In other words, the best attack is defense. After the first turn has passed players can reinforce their army. Reinforcement is gathered by number or territories a player has and whether he/she owns a continent. Reinforcement from armies is constant. If one has 14 territories that number is divided by 3 and player can put a certain number of soldiers on the board, in our particular case that is 4 soldiers. Adding to this, if a player owns a continent he gets additional reinforcement. All the continents are differently valued. Europe is worth 5, Asia 7, Africa 3, Australia 2, North America 5 and South America 2 soldiers. When one player wins another territory he draws a card. Having 3 same cards, 3 different and 2 same with a joker give you more reinforcement. Spreading the reinforcement on the right places and the right time can be crucial. If you reinforce the correct territories you can easily win the game. But make sure you don’t give out your mission by just reinforcing the same continent or same territory. If you play with veterans most likely they will uncover your mission and prevent you from winning. That’s why is a good idea to learn about advanced Risk tactics. Make a solid strategy. If you think you’ll win easier if you make a deal with someone, do it. This will spice up the game and take other players by surprise. Following the pact you made can help you to some point of the game. After you see that you have no more use from it don’t be afraid to break it. If the player decides to talk the others will start attacking him/her so he’ll have to keep his/her mouth shut for the sake of the both of you. Reinforcing one territory can out your mission. So make sure you don’t do that. Reinforcing slowly but surely can be missed by players if they don’t have extensive experience. You should always try to conquer one continent. The additional reinforcement you get from this can be helpful. Few more soldiers never hurt anybody. It can also be the deciding factor for the victory of the war and the game in general. Plan your reinforcement up front. Before attacking you can gather forces from your territories nearby to gain more straight and with that win new territory. If you do this, though, never forget to leave more than 2 or 3 soldiers on vulnerable territories. You don’t want to lose them immediately after you won. Finally, take advantages of weak territories is essential. Do you see someone’s territory left with only one soldier? Well, don’t hesitate to attack it. It’s a free territory and a card. 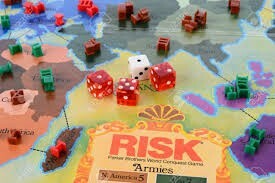 No matter if you just started playing or you are a veteran, playing Risk is a fun way to connect to people. It offers a few hours of fun and amusement. Hopefully, your friends won’t be as eager for victory as mine are because every time we decide to play together we end up not talking for the day as a result of past neglecting and constant attacking to only one player. All in all, Risk is a great game. If you like playing addicting strategy games for endless hours, this is the game for you. Hopefully, you’ll give it a try and win few games to boost your self-esteem. Regarding this, you may need to learn some advanced Risk tactics and tricks. You may also find out more about Risk Variants and House Rules.